While promoting Guardians of the Galaxy earlier this month, I had the chance to with Marvel Studios president and producer Kevin Feige about this cosmic space adventure, which hits theaters August 1. Naturally, due to the immense nature of the ever-growing Marvel Cinematic Universe, the talk shifted to future projects such as Doctor Strange, whether or not each Phase will end with an Avengers sequel, and the studio's approach to secrecy. Take a look at what the producer and the brains behind Marvel's Cinematic Universe had to say in our interview below, and you can CLICK HERE to check out what he had to say about Guardians of the Galaxy. I want to start by talking about your approach to secrecy, or, perhaps, lack thereof. There have been a lot of filmmakers who have been criticized over the last couple of years, for essentially lying to fans about certain secrets. For instance, you didn't necessarily need to announce that Josh Brolin is Thanos, but you seem to be much more up front than some of your competitors. Can you talk about that approach, and why you think it's important? Kevin Feige: Well, I would say the only active strategy involved in that, is knowing that we simply can't keep everything secret, so we choose the thing we absolutely want to remain secret. Like last year, with Iron Man 3, it was clearly the Mandarin twist, the Mandarin reveal, that we wanted to keep secret. But oftentimes, the best way to do that, we've found, is by letting people have enough information, and that's just not by us actively giving information, it just happens. It doesn't seem like we're clamping down, so it seems we're not hiding anything, so people don't dig as deep. That strategy worked on Iron Man 3, and for everything that gets out there, I'm surprised for all the stuff that doesn't get out there, and thankful for the stuff that doesn't get out there. But, when presented with something that is obvious or is out there, we certainly aren't going to hide from it. 'That's not true! What do you mean?' Then it comes true, and I look like a dummy. I also think it's brilliant how you position these movies. You're coming off of Captain America: The Winter Soldier, which is, by far, the best pure action movie you're ever done, and then you bring out this, which is just crazy, unadulterated fun. Can you talk about the strategy you have about where to position these movies? Kevin Feige: Part of it is strategy. Part of it is what is ready when, things like that. I've always said that we like the movies to feel different from one another, so that we can do two movies a year, for years and years and years, and not have people thinking we're getting formulaic or predictable. We've put out four movies in 15 months, Iron Man 3, Thor: The Dark World, Captain America: The Winter Soldier and Guardians of the Galaxy, all the Phase Two movies. I'm very proud that all of those Phase Two movies in 15 months were all successful. Well, this one isn't out yet, so I don't know, but all are very different from one another and very unique from one another, particularly from The Winter Soldier going into Guardians. I think the strategy there, even if it's a reverse-engineered strategy, is putting out one film a year that is a sequel to an existing franchise, that is anticipated and people know about and, hopefully, excited about, and then put out a movie that people haven't heard of yet, that is a new property like Guardians this year and Ant-Man next year, that can hopefully grow and become something else, so we keep doing new things, as opposed to Iron Man 5, 6, 7, 8, 9, 10, 11 and 12. Looking into the future, do you see ending each Phase with an Avengers sequel? You just announced a bunch of new release dates, and we don't know what they are yet, but will each Phase still end with an Avengers sequel? Kevin Feige: Yeah, I don't know if it will always be like that, but certainly because that is the template from Phase 1, it makes sense that it will be at least close to that. How close are you guys to finding Doctor Strange? Kevin Feige: I think we're fairly close, but it's not imminent. 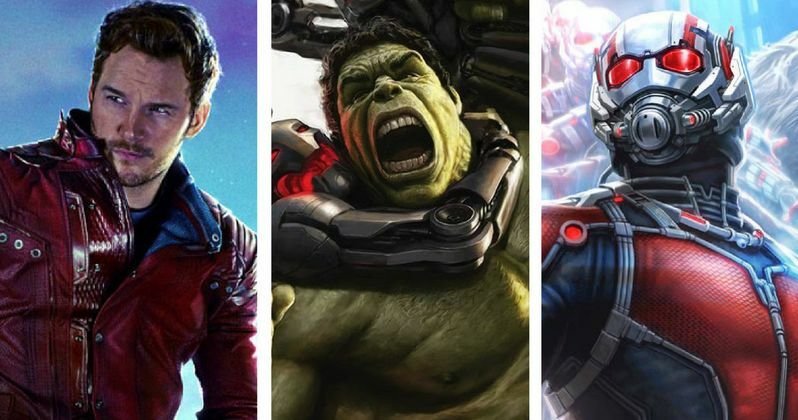 After Guardians of the Galaxy hits theaters on August 1, Avengers: Age of Ultron will wrap up Phase Two on May 1, 2015, before Phase Three gets under way just a few months later with Ant-Man, hitting theaters on July 17, 2015. Doctor Strange has also been confirmed as a Marvel Phase Three movie, along with Captain America 3.